Today’s blog comes from Queen’s Nurse Caroline Porter, Diana Children’s Nurse within CHAS. 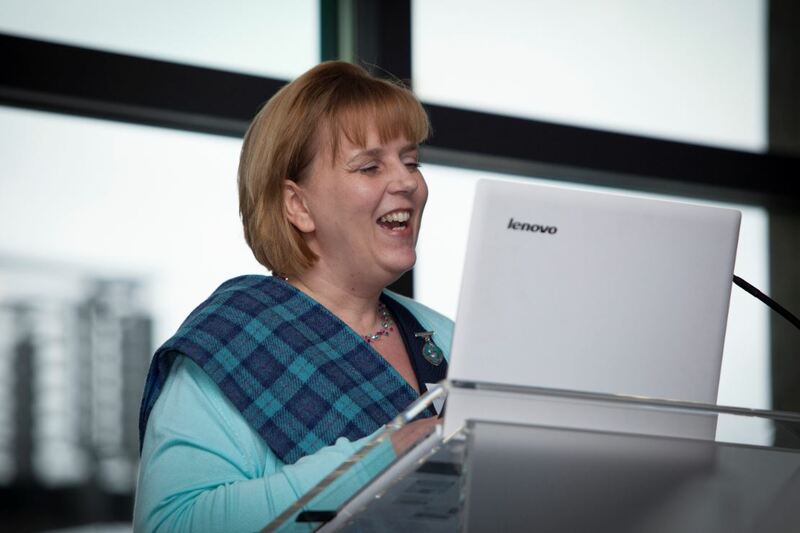 She has transformed her presentation to the QNIS Conference on her experience of becoming a Queen’s Nurse into a blog. To read more about Caroline, visit her Queen’s Nurse profile. You can follow the great work of CHAS through their twitter page. I hope to capture and share some of my key learning and experience of my 2018 Queen’s Nurse Development Programme. The Queen’s Nurses Institute Scotland (QNIS) celebrates its 130th Anniversary this year. It aims have always been to promote excellence in community nursing to improve the health and well-being of the people in Scotland. It wasn’t until I was in the programme that I realised how much I needed it. I have been a nurse for 30 years working in acute, community and hospice settings. If I am honest I was struggling. I found myself looking for opportunities to run away and escape the pressures I found myself under. I was close to burnout but was too afraid to admit this to myself never mind anyone else. I am my own harshest critic and although I didn’t realise it at the time, I was making my own role harder than it needed to be. Every nurse does a difficult job and I am no different. 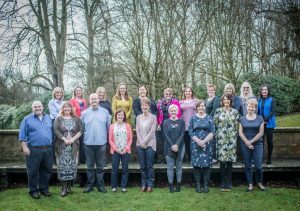 I work for a brilliant organisation Children’s Hospices Across Scotland CHAS. My role requires strategic, educational and clinical commitment. I meet families in hospital, often at a point of crisis in their lives, who may be facing the potential imminent death of their beloved child. I quickly have to form an intense, trusting relationship with families to explore potential choices around preferred place of care and preferred place of death. As nurses we tend to focus on our patients, their families, our colleagues, our own family and friends but rarely ourselves. That is what the QNIS programme has done for me. It has made me stop running and made me pay attention to myself and value my own needs. During the five day residential workshop in Balbirnie, we were introduced to the concept of Action Learning. We were grouped geographically and our group became affectionally known as the Westies. Our group very quickly developed a profound, strong bond and connection based on trust and new found friendship. The group became a safe place to explore where I really was. I have always found it easier to say I am ok, rather than to actually express to myself or another, how I was really feeling. I had such a fear of exposing my own vulnerabilities as I perceived this as me showing weakness. It was emotional for all of us but I learned that it is ok, not to be ok. I learned that most of us have similar feelings, but as nurses we bury them quite deeply. What I learned through the programme was that my vulnerabilities were my strengths and not my weakness as I had previously thought. Creativity is fed on vulnerability and it is what makes me good at what I do. Following Action Learning we met our Coaches for the programme. Again I wasn’t really prepared for the impact. How could talking to someone for an hour a month make me a better Diana Children’s Nurse and how could this impact on the issue for exploration I had identified? The focus of my coaching was primarily on Caroline the person not Caroline the Nurse. I have been historically taught through my two modular RGN and RSCN trainings, that you left your personal life in the locker when you put your uniform on for the shift. I have learned that we come to work each day as a whole person, not just Caroline the Nurse. It is impossible to fully separate the two things, it’s the combination that makes us so valuable as nurses. Kate my coach explored with me what I wanted from the coaching. I felt I wanted to bring the old Caroline back, the less stressed, good fun and care free Caroline. We explored what I had being doing to myself and focussed on the internal saboteur that reigned firmly in my head. The imposter syndrome that plagued me at most strategic and clinical meetings but neither strangely present when I worked directly with children and families. This was always my comfort zone. I discovered that both my internal saboteur and imposter syndrome where predominately creating the level of stress that I felt under. It was me that was creating this stress not anyone else. I was making my role far harder than it needed to be. Kate pushed me out of my comfort zone and requested I approach ten people to acknowledge me in three different ways. This felt really awkward as surely people would consider this fishing for compliments. Prior to the programme I physically batted compliments away. “Oh it’s just my job” or “anyone would do the same” were my normal responses to any compliments, I think this is the same of many nurses. If you think about it, it’s quite rude not to acknowledge, accept and thank someone who has taken the time and effort to compliment you. I have learned to accept compliments and to bank them as a resource of strength. Towards the end of the coaching programme, Kate asked me had we brought Caroline back. My answer was no. We didn’t need to because I was comfortable being the Caroline I am today, not needing to be someone of the past. I am enough! Kindness is such a powerful, free resource that we all possess. I have always considered myself a kind person. I have never doubted that I am extremely kind to my patients, their families, my colleagues and my own family and friends. The only person I wasn’t kind to was myself. Kindness has been weaved throughout the QNIS programme. Learning to take time for myself was a hard lesson but I have learned to embrace it. I was a sceptic of the concept of Mindfulness but now I am a complete convert. Again a simple free resource, giving yourself three minutes a day to focus on the simplistics of breathing and relaxation. It is something that everyone can achieve. The hardest part I have found is sustaining it. I have slipped at times, forgetting to place that importance on myself but the network I now find myself in with the other Queens Nurses reminds me often to reconnect. So the reality was I was close to burnout. I was hanging on by my fingertips, looking for any opportunity to run away. But it was me that placed this pressure on myself, not others. QNIS has got me looking forward to the next ten years of my career. I am ambitious, I am going on to do great things within Children’s Palliative Care. As nurses we need to learn to start by being kinder to ourselves. I firmly believe that my story is not too different from the many others who strive to do the best for the babies, children, young people, families and patients we all look after. I hope my honesty resonates with others.